Tally is a true pacific northwest native. Born and raised in Portland, Oregon, she has spent her entire life exploring the vast wilderness of the state. 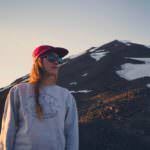 When Tally is not in the city working as a graphic designer, she can be found backpacking, hiking, and camping just about anywhere across Oregon capturing every moment along the way. Follow her travel logs at FindYourOwnAdventures.com. Find her on Instagram @tullitha.